April is National Pest Month and we want to warn people about carpenter ants. Carpenter ants become active this time of year and can cause a lot of property damage by weakening and destroying wooden structures. Anywhere in and around your house or business, including your lawn, walls, stumps, and under your foundation, are perfect nesting spots for carpenter ants. Yikes! No wonder they seem to continuously invade your home or business no matter what you try. Springtime is ant time as ants march into homes in search of food. Scientists have identified more than 12,000 species of ants worldwide. Minnesota has more than 100 ant species and about two dozen classified as pests, many homeowners will likely encounter these unwelcome visitors. 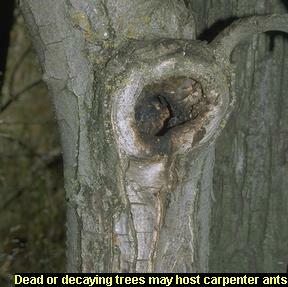 It is common to find carpenter ants in hom es during spring. A common misconception occurs when people see carpenter ants in their house around this time of year for just a few weeks and then they seem to disappear. However, as it gets warmer the carpenter ants’ feeding patterns change and they start to forage outside. People don’t think it’s a problem anymore but actually the ants are still nesting in their house. Sawdust piles. Carpenter ants are meticulous and will remove sawdust away from their nest and dump it into piles. You may find these small sawdust piles near where they live. Wet wood. If you have had water damage or water leaks at your property, take note: carpenter ants like moisture and prefer to excavate wood damaged by fungus which is often the result of moisture problems. Annual springtime visitors. If you see ants in your house on a consistent basis every spring, it’s highly likely you have a nest. It is important to try to determine whether the ants are coming from an outdoor or an indoor nest, although this can be difficult. Their presence is not sufficient evidence to conclude that there is a nest in your home. You may be able to make a more accurate determination based on when you first see carpenter ants. If you find carpenter ants in your home during late winter or early spring, that suggests the ants are coming from a nest in the building. However, if you see activity later in the year, it is less clear if the nest is in the building. There are several areas where carpenter ants are usually found including: windows, window sills and frames, doors and door frames, adjacent to plumbing fixtures, attics, crawl spaces, porch supports, steps, under patios and decks, and around gutters and downspouts. If carpenter ants are suspected, a Minnesota Pest Control Expert should be contacted for a thorough inspection to determine the extent of the infestation and then a treatment strategy and follow up plan should be discussed.